View east to Panguitch Lake in western Garfield County, beyond which is Haycock Mountain and newly discovered exposures of the Markagunt Megabreccia. 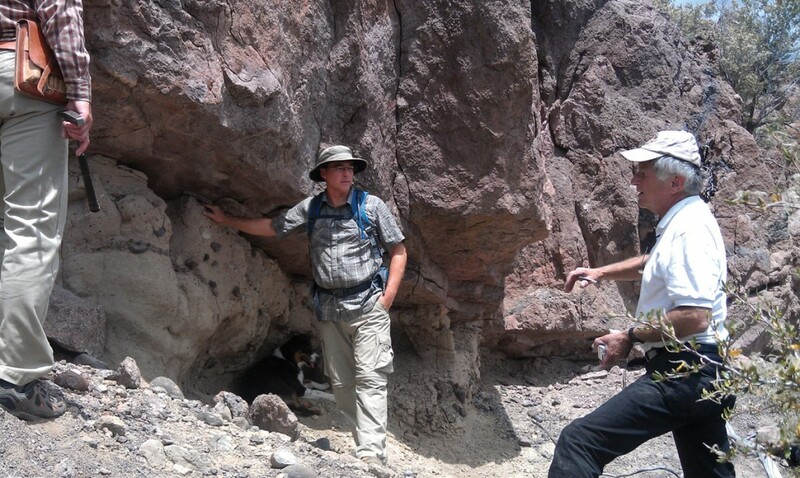 Bob Biek is a Senior Scientist with the Utah Geological Survey’s Geologic Mapping Program. 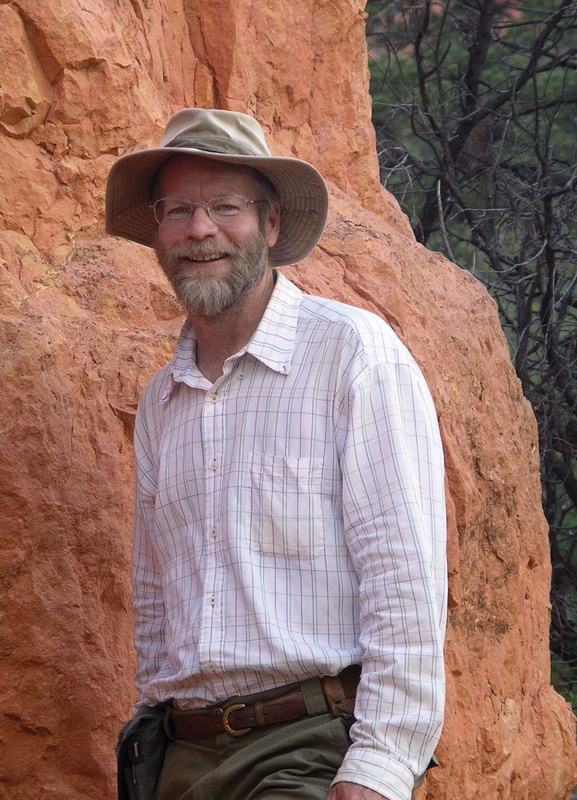 Since joining the Survey in 1996, he has published over two dozen geologic maps of 7.5′ quadrangles along Utah’s Wasatch Front and in southwestern Utah. He is the senior author on the St. George and Panguitch 30′ x 60′ quadrangle geologic maps, and is starting to map the southeast sector of the Marysvale volcanic field in the west half of the Loa 30′ x 60′ quadrangle. Numerous very large landslides, known as gravity slides, are preserved throughout the western U.S. The desert basins of southern California contain many well-studied examples, as does southwestern Utah (for example, large gravity slides associated with the Iron Axis intrusions and the west side of the Beaver Dam Mountains—see Survey Notes, v. 34, no. 3, p. 1–3 and v. 41, no. 2, p. 4–6). What few people know, however, is that Utah has another, much larger gravity slide northeast of Cedar City on the Markagunt Plateau of southwestern Utah. The story of the discovery of this enigmatic deposit and how it came to be understood is a testimony to the patient research of many geologists, recently culminating in a new geologic map of the region. What is the Markagunt Megabreccia? The Markagunt Megabreccia was named in 1993, just over a decade after geologists first began to realize that the gently east-tilted, high-elevation Markagunt Plateau was capped by something other than the normal sequence of volcanic rock commonly found in southwest Utah. At its simplest, the Megabreccia is a great sheet of volcanic rock that slid many miles, placing older rock on younger rock above a subhorizontal surface. Blanketing much of the central and northern Markagunt Plateau, it consists of very large blocks of Miocene and Oligocene regional ash-flow tuffs (originally erupted from calderas near the Utah-Nevada border) and locally derived volcanic and volcaniclastic rocks. One way to think of the Markagunt Megabreccia is like a deck of thick cards that are sheared between one’s hands strata are intensely deformed along the shears themselves, but remain relatively undisturbed in the interior of the blocks. The fact that the Megabreccia consists of large blocks many square miles in size, bounded below by an inconspicuous shear plane, is one of the reasons it remained undiscovered for so long. Elsewhere, the Megabreccia is a structurally chaotic assemblage or consists of large tilted blocks of these rocks. Nearly everywhere, rocks immediately below the Megabreccia are undisturbed. The Markagunt Megabreccia is indeed Mega! It covers at least 300 square miles of the northern and central Markagunt Plateau, an area somewhat larger than the whole of Salt Lake Valley and nearly ten times the size of New York City’s Manhattan Island. Because the inferred source area of the Markagunt Megabreccia is partly concealed beneath north-central Parowan Valley, the full extent of the Megabreccia must be greater still, probably at least 360 square miles (additional debris avalanche deposits south of Cedar Breaks National Monument suggest that the original gravity slide was larger yet, perhaps closer to 500 square miles). It is by far the largest of a dozen or so gravity slides known in Utah. The Markagunt Megabreccia exhibits the full range of structural features commonly seen in modern landslides, including compression and resultant folding and thrust faulting in the landslide’s toe area, simple translational movement across the main body of the landslide, and extensional faulting in the upper parts of the landslide. The diagram on page 2 illustrates the main features of gravity slides, which are a special class of extremely large landslides. There is no single place where we can go to see the entire story encapsulated by the Megabreccia. Different geologists have seen different parts of the beast, and thus understandably came to different conclusions about this complex unit. It reminds me of the allegory of the “blind men and the elephant.” Part of it feels like one thing, other parts like something else; in the beginning it was simply too big and too strange for any one person to understand. Early, small-scale geologic maps of the plateau didn’t even recognize the Megabreccia. Those geologists—who necessarily mapped in reconnaissance mode, setting the stage for later more detailed geologic mapping—mapped just the back of the elephant and understandably did not recognize the Megabreccia for what it was at the time. The discovery and our still-unfolding understanding of the Megabreccia began in the early 1960s when John Anderson, then working on his dissertation at the University of Texas at Austin, mapped the geology of the northern Markagunt Plateau. He and his student assistant, Pete Rowley, found several small areas of older volcanic rocks resting on younger volcanic rocks, and attributed their origin to sliding down the flanks of oversteepened volcanic domes. It wasn’t until the late 1980s to early 1990s, when John (then a Professor at Kent State University) and half a dozen U.S. Geological Survey-supported Master’s students continued mapping in this area, that they finally had enough information to grasp what they were dealing with. Unfortunately, their work was cut short following reorganization of the USGS in the mid 1990s, when they had only just begun to appreciate the scale of this beast. Nevertheless, their combined work laid a solid foundation for future mapping in the region. I’m the lucky guy who, having been able to build on what John and his colleagues learned, stumbled across the beast’s trunk, which let us revise much of what we now know about the Megabreccia. Gravity tectonics describes the movement of large slabs or blocks of the Earth’s brittle, uppermost crust under the dominant influence of gravity. It is a general term that encompasses a variety of very large scale, gravitationally induced earth movements that include gravity slides, rock and debris avalanches, spreading and collapse of volcanic centers, submarine slope failures, and other large earth movements, each of which is bounded below by a distinct plane of detachment. A variety of mechanisms are known to form such features, for example, the collapse of steep range fronts possibly triggered by earthquake shaking, and shallow igneous intrusions or caldera inflation that tilt overlying strata causing it to fail. Rates of emplacement can range from slow (inches or feet per year) to fast (at speeds approaching that of a bullet train). There are two schools of thought regarding the description of gravity slides, one that uses terminology adopted from the field of structural geology, the other from the study of modern landslides. Descriptive terms thus reflect the inherent bias of geologic specialization and of scale, but confusion also results from inferred rates and style of emplacement and on whether movement takes place in the upper crust or at the Earth’s surface. Many geologists prefer the term detachment fault to describe the basal gravity slide surface, but, more and more, geologists are using landslide terminology to describe what in many cases are truly gargantuan, commonly catastrophic landslides, not fault blocks emplaced by episodic tectonic faulting. Descriptive terminology is also confusing because every style of tectonic faulting can be produced by landsliding, and it is not always apparent whether such features result from gravitational or tectonic forces. But one thing is certain—gravity slides are a type of landslide of terrifyingly, inconceivably large proportions. Vertically exaggerated block diagram of an idealized gravity slide. Here, the trigger is a shallow igneous intrusion (the Iron Peak laccolith) emplaced within a few hundred feet of the Earth’s surface, causing arching of overlying strata and consequent failure on over-steepened slopes. Note the four main bounding surfaces: the bedding-plane detachment in mechanically weak clay-rich rocks of the Brian Head Formation; the ramp, where the slide mass breaks upward to the surface; the former land surface, now covered by the slide mass; and the flanking detachment, in essence a strike-slip fault that bounds the margin of the slide. The basal detachment resembles shallow low-angle faults, complete with slickensided and striated surfaces, gouge zones, and brittle microfabrics. Extensional deformation characterizes the upper part of the slide, whereas compressional deformation characterizes the toe area. The main part of the gravity slide remains mostly intact with individual blocks as much as several square miles in size, preserving a stratigraphy inherited from the source area. Frontal portions of the slide mass disaggregate into debris avalanche deposits. Because gravity is the ultimate driver of such large landslides, the dip of the slip surface must be sufficient to overcome the shear or frictional strength of the detachment layer (but still is likely less than a few degrees). Once moving, however, the slides can travel many miles over former land surfaces. Inset shows growth of laccolith: (a) initial lateral injection of igneous intrusion to its fullest extent, (b) vertical growth of laccolith from continued injection of magma, and (c) gravity sliding of oversteepened flanks. Modified from Hacker and others (2002). 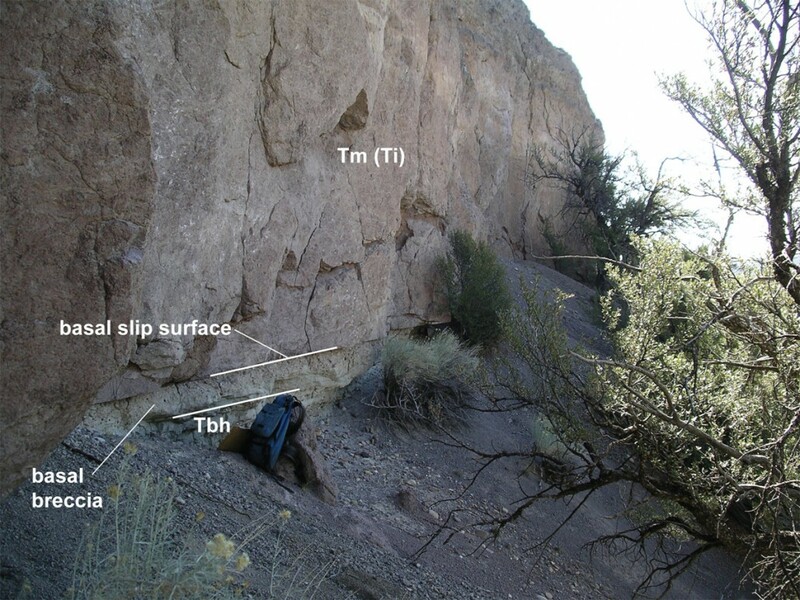 Any geologist familiar with the volcanic stratigraphy of southwest Utah would stand atop Haycock Mountain and with utter confidence declare that the Isom Formation, a densely welded, 27- to 26- million-year old ash-flow tuff that forms its resistant caprock, is undisturbed and in-place. Several have done just that. But while mapping that area, I came across several exposures—preciously small and hidden by mountain mahogany, pinyon, and juniper trees—of the base of the Megabreccia that no geologist had ever seen. 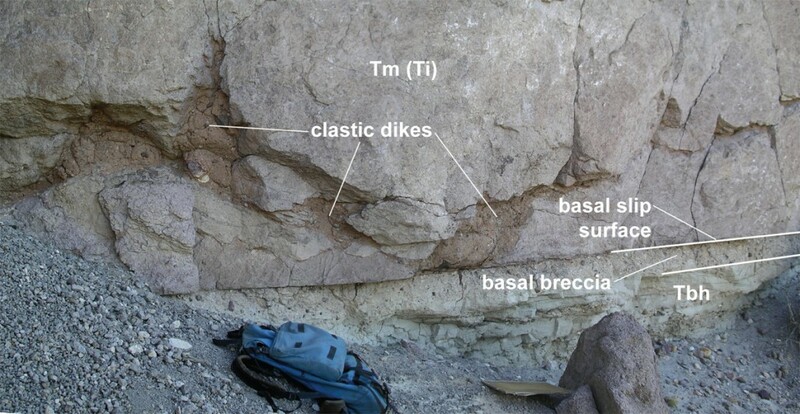 There, the lower few tens of feet of the Isom Formation were brecciated and locally pulverized to rice-size pieces and then resilicified, grading upward into undeformed Isom at the crest of the mountain. The rock is technically called a cataclasite, having formed through extensive fracturing of the parent rock; it everywhere overlies a thin layer, typically one inch to one foot thick, of what looks like concrete. 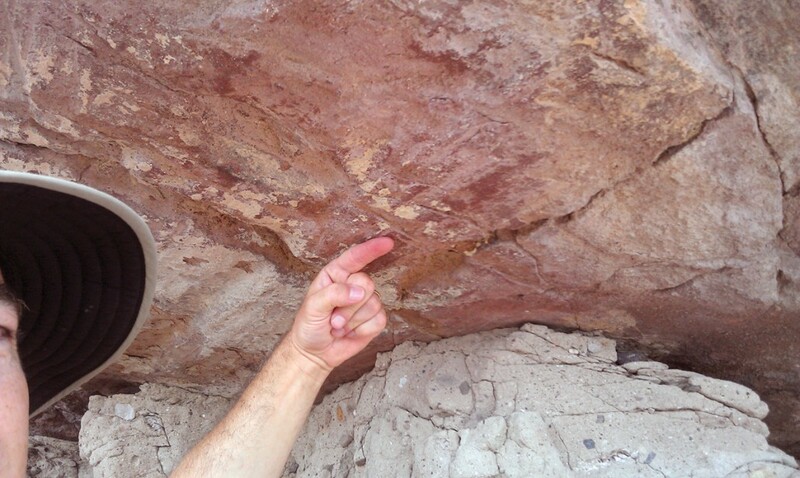 This thin basal breccia represents broken up, over-pressured debris that the gravity slide rode on and that was injected as dikes at the base of the Megabreccia. The base of the Megabreccia is a sharp, planar surface with striations, grooves, and small-scale brittle microfabrics including fractures known as Riedel shears, all of which serve as directional indicators, telling us that the Megabreccia was emplaced from north to south. The Haycock Mountain exposures are the “trunk” of our mythical beast, something that no geologist had previously seen or understood. The exposures are important because the cataclasite, basal breccia and clastic dikes, and brittle microstructures provide strong evidence of catastrophic emplacement by gravity sliding, not by slow gravitational spreading or creep nor by seismically cycled thrust faulting. Further, these exposures unequivocally demonstrate south to southeast transport of the Megabreccia, not northward transport as originally inferred. This is the kind of evidence that most of us can only dream about finding (and which commonly comes about only after others have appreciably narrowed the search for instructive exposures!). Geologists designate type sections of rock formations, a place where characteristic features of the rocks are well developed and can be readily studied. John Anderson designated a 2-mile stretch along Utah Highway 143, just east of Panguitch Lake, as his Markagunt Megabreccia reference section. Given what was known at the time, John and his colleagues reasonably interpreted the caprock of Haycock Mountain as in-place—part of the lower plate, undisturbed volcanic Isom Formation. But what he could not have known is that the true size of the Megabreccia was even larger than he imagined. Ironically, his reference section turned out to include just the uppermost part of the Megabreccia—a fuller story of the Megabreccia awaited discovery in exposures just a few miles to the south at Haycock Mountain. In their defense, early mappers of the Megabreccia started out in puzzling northern exposures, in essence high on the back of the elephant, so it wasn’t readily apparent exactly what kind of creature they had. Mapping of the frontal margin of the Megabreccia, where critical exposures are best preserved, came last, and fell into my lucky hands. Yet still, as described in the recently open-filed geologic map of the Panguitch 30′ x 60′ quadrangle (UGS Open-File Report 599), we remain uncertain about several aspects of the Markagunt Megabreccia: its full northern extent, the location of its flanking faults, and certain features of its southern exposures, including possible debris avalanche deposits south of Cedar Breaks National Monument. When did the Megabreccia form? The age of emplacement of the Markagunt Megabreccia is constrained by the age of its underlying and overlying rocks. The Megabreccia was originally thought to be overlain by the apparently undisturbed 22.8-million-year-old Haycock Mountain Tuff, but we now recognize that this tuff simply rode along on the back of the great slide as a mostly undisturbed block many square miles in extent. During our recent mapping, we discovered exposures of the Megabreccia that overlie the 22.0-million year-old Harmony Hills Tuff and stream gravel deposits that contain rounded cobbles of eroded Harmony Hills Tuff. Thus, the Megabreccia must be younger than 22 million years old. Unfortunately, we lack overlying, post-Megabreccia rocks to significantly constrain its upper age. However, because the Megabreccia is preserved in grabens at the west margin of the Markagunt Plateau, we infer that emplacement of the Megabreccia predates the main phase of basin-range deformation, which resulted in the present topography and which began about 10 million years ago at this latitude. The Megabreccia was thus emplaced between 10 to 22 million years ago, and likely about 20 million years ago as described next. How did the Markagunt Megabreccia form? Geologists don’t know for sure what triggered the gravity slide that led to formation of the Markagunt Megabreccia. This is a particularly vexing problem because the northern part of the Megabreccia, and areas even farther north, are mostly volcanic mudflow deposits of the Mount Dutton Formation; it is difficult to know where these rocks are part of the Megabreccia and where they may postdate and thus bury the Megabreccia. But given what we do know, there are two plausible explanations: (1) doming and subsequent southward sliding of roof rocks off the Iron Peak laccolith or related intrusions in the northern Markagunt Plateau, or (2) related to inflation of the crust due to emplacement of intracaldera intrusions following eruption of the 21- to 20-million year-old Mount Belnap caldera. Utah’s Miocene landscape looked very different than that of today; Utah occupied the east side of the Great Basin altiplano, a high-elevation plateau studded with volcanic mountains and intervening basins, analogous perhaps to the modern Altiplano of South America. The oldest volcanic rocks in southwest Utah belong to the Brian Head Formation, clay-rich volcaniclastic rocks and rhyolitic ash beds that spread across the southwest part of this high-elevation region. Brian Head strata are overlain by several aerially extensive, densely welded ash flow tuffs that erupted from calderas near the Utah-Nevada border, which in turn are overlain by volcanic mudflow deposits and lava flows that erupted from vents on the northern Markagunt Plateau and in the southern Marysvale volcanic field. The foundation on which at least the southern part of the Marysvale volcanic field rests is thus non-resistant, clay-rich, fine-grained volcaniclastic strata of the Brian Head Formation that even today are highly susceptible to landsliding. This weak foundation is key to either explanation of the Megabreccia’s origin. Given our current understanding of the Megabreccia, our favored trigger is the 20-million-year-old Iron Peak laccolith, an idea first suggested by USGS geologists Florian Maldonado and Ed Sable in the mid-1990s. The laccolith was emplaced as molten rock from deep within the earth moved upward via vertical dikes into the Bear Valley and Brian Head Formations, where it spread out into a shallow, mushroom-shaped intrusive dome. Although modern exposures of the Iron Peak laccolith appear too small to have created a dome large enough to produce the Markagunt Megabreccia, only a small part of the Iron Peak laccolith is preserved—it must have been much larger. Evidence for its larger size includes numerous dikes in Claron strata immediately to the west of the laccolith; these were likely feeder dikes, suggesting that large parts of the laccolith must have overlain this block before being removed by erosion. An even larger laccolith can be envisioned if we postulate that part was faulted down to the west and buried by basin-fill deposits of Parowan Valley. Aeromagnetic anomaly maps and well data also suggest the Iron Peak laccolith is part of a much larger intrusive complex that underlies the Red Hills, northern Parowan Valley, northern Markagunt Plateau, and the valley north of Panguitch. In this intrusive complex, most if not all intrusions are laccoliths. Inflation of this larger complex, or several individual laccoliths within it, may have triggered catastrophic sliding of the Megabreccia. The 20-million-year-old Iron Peak laccolith is the correct age as a trigger for the Megabreccia. It is also possible that the Markagunt Megabreccia resulted from collapse of the southwest part of the Marysvale volcanic field. In 1993, University of Arizona geologist George Davis and USGS colleague Pete Rowley proposed a “two-tiered” model wherein the southeast part of the volcanic field spread and collapsed under its own weight, creating southward-directed thrust faults rooted in evaporite strata of the Middle Jurassic Carmel Formation. These thrust faults are part of the Ruby’s Inn thrust fault zone on the adjacent Paunsaugunt Plateau, which displaced Upper Cretaceous strata over early Tertiary Claron Formation. They also envisioned the Markagunt Megabreccia to be a surficial part of this process, perhaps triggered by near-surface laccolith emplacement and consequent doming and catastrophic failure of overlying strata. 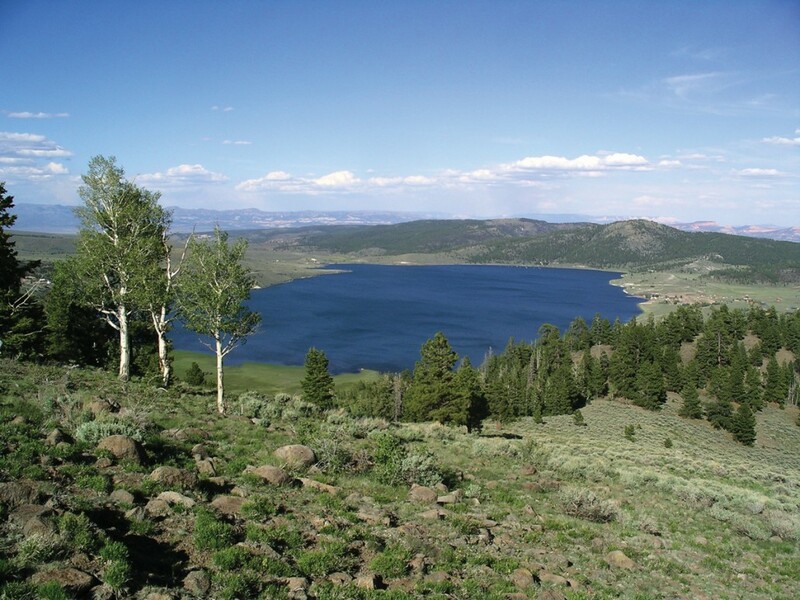 Collapse of the volcanic field could also have resulted from inflation of the 21-million-year-old Mount Belnap caldera in the southwest part of the Marysvale volcanic field. If so, the Megabreccia would be at least twice as long and nearly three times the aerial extent of what we now envision (this is comparable to but still the junior of the famous 1300-square mile Heart Mountain detachment in northwest Wyoming, the World’s largest terrestrial gravity slide). Thus, we have several possibilities but lack a definitive trigger for the formation of the Markagunt Megabreccia. Of the possibilities, gravity sliding off the Iron Peak laccolith seems the most likely. This idea is supported by similar gravity-slide deposits in the Pine Valley Mountains, which are tied to shallow igneous intrusions that domed up overlying strata, leading to catastrophic failure on oversteepened slopes (see Survey Notes, v. 34, no. 3, p. 1–3). The densely forested, high elevation Markagunt Plateau has long been a refuge for those seeking both winter recreation and a cool respite from the summer heat of the valleys below. We all see this landscape somewhat differently. Botanists and wildlife enthusiasts revel in the diversity of plant and animal life and its profound changes with elevation along its 5000-foot-high western escarpment, culminating with spruce forests, isolated groves of ancient bristlecones pines, wildflower-filled meadows, and plentiful elk. Those whose life’s work revolves around water will see the plateau as the ultimate watershed that sustains life in the dry basins below. Even those of us with no specific bias enjoy the scenic diversity and open space the plateau offers. But who else besides a few geologists have ever really seen and understood the rocks that cap much of the northern Markagunt Plateau? Who knew about the collapsed remains of an ancient volcanic center that covers an area at least as large as the entire Salt Lake Valley? It’s exciting to think that such spectacular geologic phenomena remain to be discovered and understood.